Common Home Buying Myths – Busted! So you’re ready to buy a home, upgrade or downsize from your current home, or are just looking for something new! In this exciting but admittedly scary time, you might be inclined to turn to friends and family for advice. While anyone who watches HGTV thinks they are a professional, they might not be the experts they (or you) think they are. You could be receiving bad, though well-intended, advice without even knowing it. We’re here to bust the most common misconceptions about home buying so you can do this thing the right way – because this is what we do. Myth #1: Your down payment must be 20%. Sure, a 20% down payment is ideal if you want to avoid that pesky private mortgage insurance (PMI), but many lenders will be glad to offer up home loans with 10% or 5% down—as long as you’re willing to foot the monthly bill for PMI. 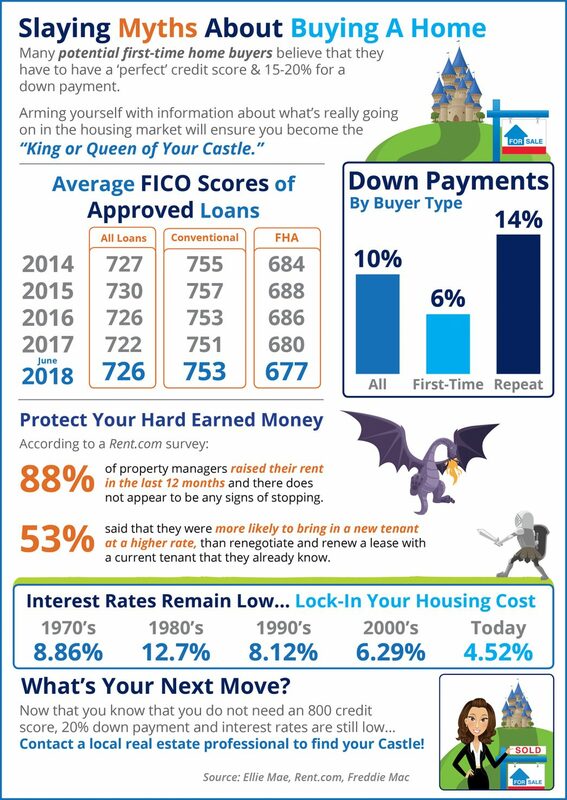 Or you can skip the conventional loan and head to the Federal Housing Administration for a government-backed loan with only 3.5% down, if you qualify. In fact, there are thousands of options for down payment assistance. And while many programs are geared toward low-income homebuyers, you don’t have to be penniless. There are lots of different ways you can qualify for help on the local or federal level. Myth #2: You can’t buy with bad credit. If you’re looking to get a conventional loan, having bad credit might give you a full stop. However, FHA loans require only a 3.5% down payment and borrowers with low credit scores – even under 600 – can qualify. Keep in mind, though, that FHA loans may look great at first, but they definitely aren’t for everyone. Myth #3: You don’t need a home inspection. Myth #4: The asking price is set in stone. Much like buying a car, the offer you make on a house does not necessarily have to be the asking price. If you have stellar credit, pre-approval, and a down payment ready to go, sellers might be more willing to negotiate than to wait for another, possibly less awesome, buyer to come around. Plus, if your home inspection (you know—the one we mentioned above that you got because you don’t believe myths) turns up issues, you can use those to your advantage in your negotiations. Myth #5: A 30-year mortgage is the best option. Myth #6: You don’t need an agent. You might think you can do this home-buying thing solo. After all, isn’t that what the Internet (and HGTV) is for? While everyone is different, we urge you to resist the urge to DIY your first home purchase and call a realtor instead. Realtors are pros who bring expertise to the table. Don’t let what you think you know derail you from the home of dreams. Give us a call today so we can bust any other myths out there!